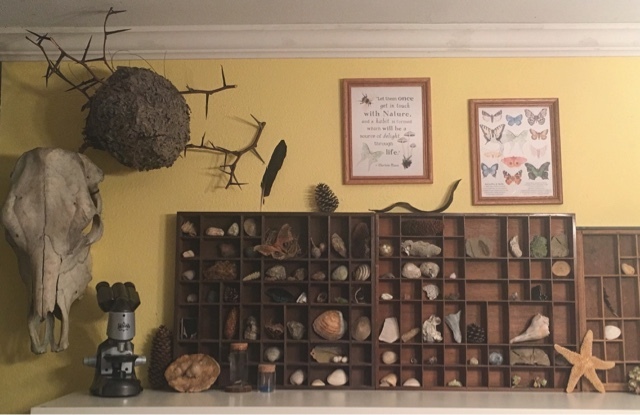 Over the years we have collected things we find in nature that are fascinating and unusual, but in the past few months that collection has really started to grow. 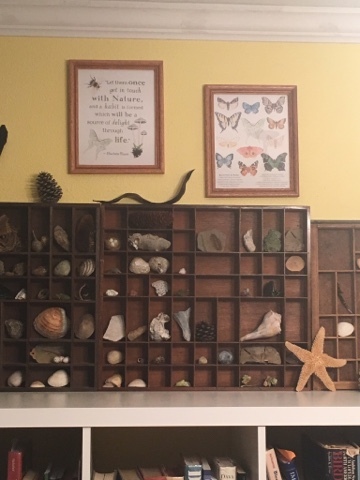 After getting some ideas on how to showcase these treasures I began searching out 'print trays' or curiosity or knick-knack shelves and with the help of some dear friends, our nature shelf has really taken off. Our very first find was a really unique and interesting fossil that Carlie found while she and the boys were out on a little hike. 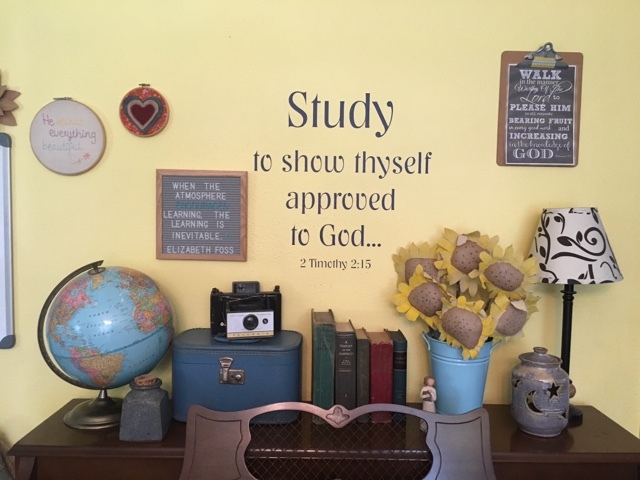 Another was the geode that Abram found one year while we were on Constructors for Christ in Kentucky. We have had friends bring us seashells, or sand dollars. We have found dead butterflies, shark teeth, moss, and what not. 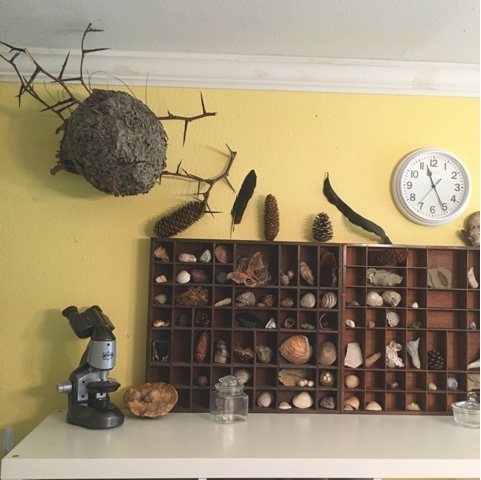 We have also participated in nature swaps with people from across the country, those were so fun to see what another family from another state would send! Anyhow, as you can see, we have been adding to our shelf and it is looking marvelous. I also try and straighten up the piano in preparation for lessons to begin again. Giving happy, encouraging quotes and scriptures as we begin our new year. 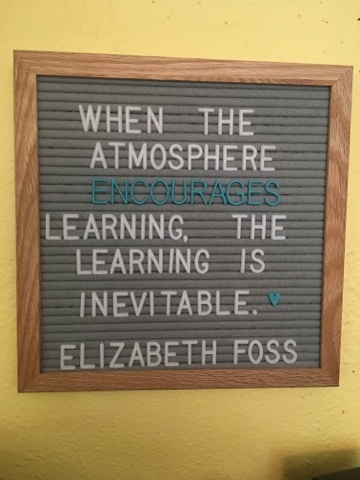 I thought this quote was a great one for the classroom area. That's a goal. 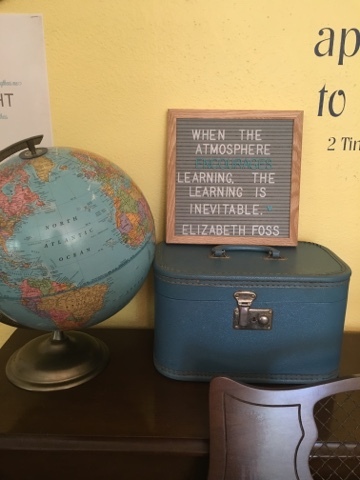 To make our home an atmosphere that encourages learning. 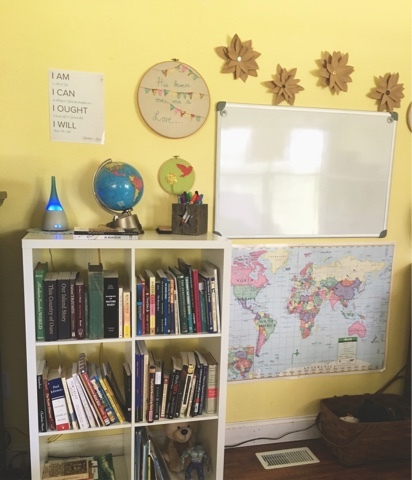 This little shelf now houses our most current lesson books. We will use it to swap in and out when we finish with a book and add a new one to our daily/weekly use. Just a quick little tour of how I've tried to spruce up the area before we started school this week. 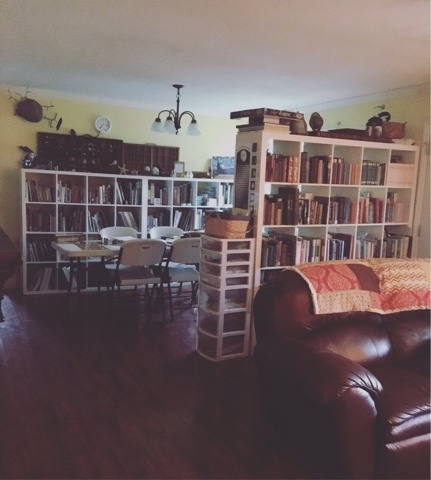 I love a fresh, tidy space. It always helps me be more motivated. I just found your blog, and I look forward to getting to know you. Your home is so cozy and I love your kitchen table. I have been inspired looking over your past post, I can't wait to read them as well.